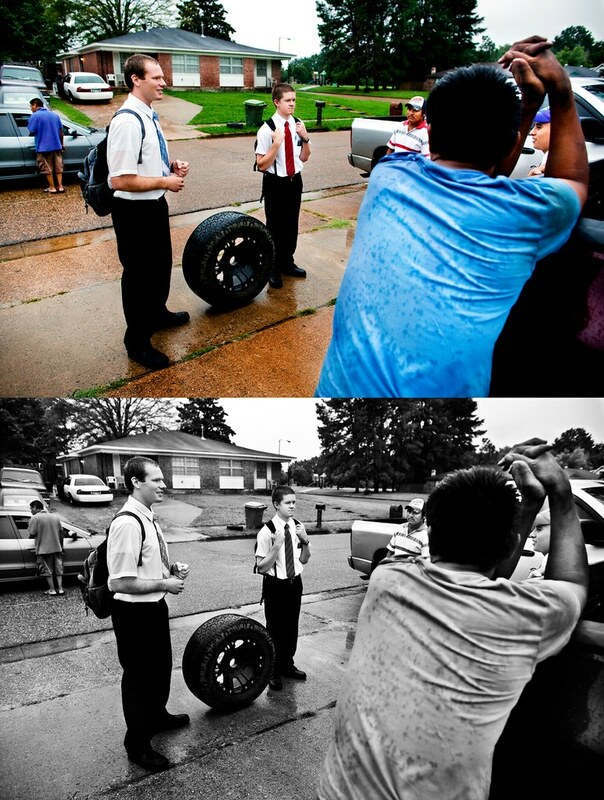 Yesterday, I was covering Elders Matthew Reed and Caden Scott of the Church of Jesus Christ of Latter Day Saints for a story the Appeal is doing on how Memphians, outside of Mormon culture, view that faith. Reed and Scott are serving their two year missionary time in Memphis walking around door-to-door sharing their faith with a focus on Hispanic neighborhoods. I learned about this when I first tried calling Reed and discovered his voicemail was in spanish. My first thought was, “Okay…I hope this is the right guy because I didn’t hear a name in there and I hope he understands and speaks English too; otherwise, I have no idea how I am going to make contact with him.” We had a good chuckle about that when I met up with them. The fever of heat Memphis has suffered the last week or so finally broke with some much deserved rain. I was a little concerned that no one would be around when the elders would be doing their door-to-door sharing, but the rain was light, and there were quite a few people out enjoying the cooled off air that we came across this group of hispanic men. I’m a big fan of layers in my images, letting my eye bounce around the frame, and usually I don’t like shooting from behind someone in my work. I find eye contact between people in the frame give a greater sense of story than not, but I find the body posture of the man in the foreground to be interesting enough to dust off that photo class on faceless people from my memory. Also, I like how the guy on the far right is framed in the arms. When I get a photo from an assignment that I am satisfied with and concerned putting up on this blog, I do like to make a color and b&w version of the photo. I’m a really big fan of old-school, b&w white photojournalism and with everything I do for work being shot in color, I enjoy the variety and the simplicity of storytelling b&w can offer. All that to say, this image has stumped me as to whether it should go on here in color or b&w, so I’m putting up both. Ultimately, I think color would win because of the repetition of blues in the frame and the faceless man’s posture stands out a little bit better. Still, I love how this composition looks in b&w and I like how the wrinkles and raindrops on the faceless man’s shirt stand out and again, just the simplicity of it. Definitely the color version. The purple hat really helps jump right to the triangle frame. Plus there is a certain contrast with the blandness of the shirt and tie with the bits of color in the locals' clothing. i'm drawn more to the facial expressions on the elders in the b&w, but overall have to agree with aaron on the color, it's a great shot!